Atlasta Solar provides business owners with solar energy solutions that are affordable, accessible, custom, and efficient. We help decrease your bills and increase your assets. Our solar designers will bring information to educate you about commercial utility rate structures, the products we provide, the incentives and rebates currently available and the benefits of going solar! Is your business ready for clean energy? Call today to schedule your complimentary consultation! 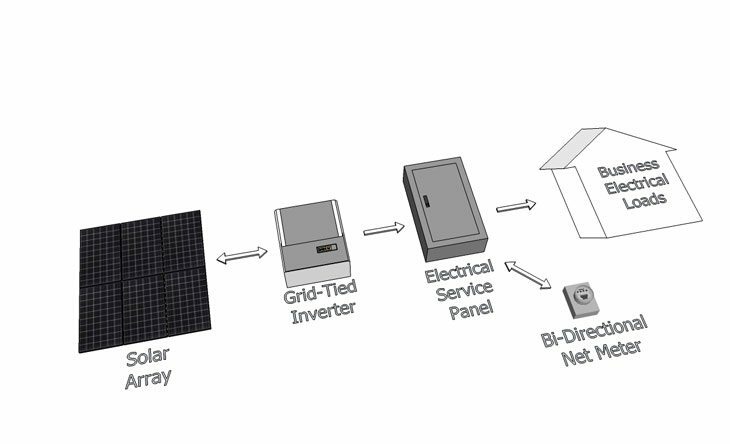 1) Photovoltaic (PV) panels collect the suns energy (DC) and transport it to the grid tie inverter. 2) The inverter transforms the energy from direct current (DC) to alternating current (AC) power for your business use. 3) AC power is delivered to the building’s electrical box. Power is either used by the building or sent through the net meter to the utility grid. 4) The difference between the electricity created by your solar system and what you consume is the amount for which you are charged or credited on your bill. Receive Renewable Energy Credits (REC).